Wisconsin Oven Corporation shipped two (2) natural gas direct fired heavy duty walk-in series ovens to China to a manufacturer of automotive parts. The industrial ovens will be used to bake out phenolic resin from automotive brake components. Wisconsin Oven Corporation shipped two (2) natural gas direct fired heavy duty walk-in series ovens to China to a manufacturer of automotive parts. 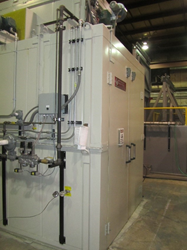 The industrial ovens will be used to bake out phenolic resin from automotive brake components. These ovens are a duplicate of a previous order from this customer. The work chambers of these walk-in ovens are 6’ W x 13’0” L x 8’6” H and the maximum temperature rating of 500°F. Both batch ovens have temperature uniformity of ±9°F at 450°F that was proven by a fifteen (15) point test. The oven bodies are constructed with tongue and groove panel assemblies featuring our patented high efficiency panel seams (provides 25% better insulating efficiency). These walk-in ovens feature combination airflow, providing both horizontal and vertical upward airflow, which maximizes heating rates and temperature uniformity. These walk-in ovens were fully factory tested and adjusted prior to shipment from our facility. All safety interlocks are checked for proper operation and the equipment is operated at the normal and maximum operating temperatures. An extensive quality assurance check list was completed to ensure the equipment met all Wisconsin Oven quality standards.